Mohamed is a leading cyber security expert in the Middle East. He works as an independent cybercrime researcher, cyber terrorism expert, and consultant for international organizations. Mohamed is also the president of ISSA (Information Systems Security Association) chapter in Egypt and frequent speaker at national and international conferences. 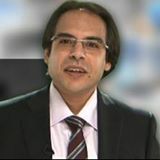 Currently he presents a Technology TV Show called “Tech Talk” on (Cairo Centric), the leading TV Channel in the Middle East. He works also as an assessor at BCS, The Chartered Institute for IT in the UK, visiting professor at October 6 University, Faculty of Media & Mass Communication.